Dale Alexander, the hard-hitting first baseman who was Boston's first American League batting champion, began and ended his playing career in his hometown of Greeneville, Tennessee. David Dale Alexander was born and raised on a 117-acre farm in Greene County on April 26, 1903. He had four brothers and four sisters. His two sons, Don and Steve, still live on the same farm, next door to each other. The land has been in the Alexander family from before 1796, when Tennessee became a state. Dale's father, Don Alexander, raised corn and tobacco, and was a catcher with the local Greeneville team, "an old bare-handed catcher in the Appalachian League," according to his namesake grandson. His son Dale was big enough to earn the nickname Moose and stood 6 feet 3, with a playing weight of 215 pounds. The right-handed hitter was born and died in Greeneville. Dale never used tobacco in any form, and his sons stopped planting tobacco years ago. Alexander stayed in school and graduated from Milligan College, a Christian college in East Tennessee, where he starred in football and basketball as well as baseball. He also played baseball for Tusculum College, in Greeneville, and was inducted into the Tusculum Hall of Fame in 1984. It was at Tusculum that his grandson Steve Jr. starred at baseball, earning MVP status in 1990 and 1991. Steve joined his grandfather in the Tusculum Hall of Fame in 2001. Dale Alexander was spotted and signed by Frank Moffett and Billy Doyle of the Detroit Tigers organization. His first season in pro ball was 1924, with Greeneville in the Class D Appalachian League. He played first base, as he did throughout his career with the exception of a bit of outfield work with Newark in 1934. Dale hit .332 with Greeneville in 389 at-bats over 114 games. The Charlotte team paid $500 to buy his contract, and in 1925 and 1926, he played in the South Atlantic League and maintained a similar average each year (.331 and .323) while showing additional power -- 20 home runs and a league-leading 44 doubles in 1925, driving in 120 and 96 runs respectively. After the season, Charlotte sold his contract to Toronto for $5,000. Alexander played in 1927 and 1928 with Toronto in the International League, batting .338 the first year and driving in 97 runs. Opposing manager George Stallings dubbed him "The Ox." His second year with Toronto, 1928, was a tremendous season, as Alexander won the Triple Crown, leading the league with a .380 average, 31 home runs, and 144 RBIs. His 236 hits, 400 total bases, and 49 doubles were all league-leading categories as well. He'd earned a promotion to major-league baseball and prepared to play for the Tigers beginning in 1929. There were caveats even before Alexander arrived in the majors. A late 1928 article in the Atlanta Constitution compared him in stature to Babe Ruth and found him reminiscent of Sam Crawford, but noted that some in the International League said that "his slowness in the field and on the bases may ruin his chances. On the other hand, they aver that he can hit a ball almost as hard as Babe Ruth." [Atlanta Constitution, December 1, 1928] Detroit paid a lot for him; the deal with Toronto for Alexander and right-handed pitcher Johnny Prudhomme cost the Tigers a reported $100,000. Dale was a durable star for Detroit. In his first two seasons, 1929 and 1930, he played in every game for the Tigers, and he played exceptionally well. His .343 average ranked him ninth in 1929; his 137 RBIs placed him third in the league and set a rookie record at the time. (The current record was set in 1939 by Ted Williams, with 145 RBIs.) Alexander was fifth in home runs with 25. He had 363 total bases, second in the American League. His 215 base hits led the league; he was the first rookie in the league to amass more than 200 since Joe Jackson in 1911. Had there been a Rookie of the Year award in 1929, Moose would have been a prime candidate. Baseball Digest in November 1975 named Alexander as the all-time rookie at the first-base position. His sophomore season was solid, too. He figured a bit less across the board (.326, 135 RBIs, 20 HRs) but it's hard to quibble with production like that. In his third year, 1931, Alexander seemed to lose his home run stroke, hitting just three, but he doubled 47 times, compared with 33 the year before, and maintained his average (.325) over 517 at-bats. He drove in a lot fewer runs -- but 87 RBIs is still more than respectable. It was a good year for doubles, 1931. Earl Webb of the Red Sox set the all-time record, one that still stands, rapping out 67 two-baggers -- 20 more than Alexander, the runner-up. Webb batted .333, hit 14 homers, and drove in 103 runs. Though Webb was batting only .281 for the Red Sox as of June 12, 1932, the Tigers saw Alexander having an even rougher year: Moose had played in only 23 games, hadn't had an extra-base hit, and was hitting just .250, with but four RBIs. The Tigers had a new, excellent-fielding first baseman in Harry Davis. It looked as though Alexander might have come to the end of the road; the Tigers even put him on waivers. The Red Sox had tried several first basemen (Bill Sweeney, Johnny Watwood, Johnny Reder, and Al Van Camp), but were satisfied with none of them. Van Camp was hitting in the .230s before the trade. The Sox were looking to make a change and dealt Earl Webb to the Tigers in a midseason deal for both Dale Alexander and outfielder Roy Johnson. It was a great trade for the Red Sox. Alexander caught fire and won the American League batting title, while Johnson, who'd been batting .251 for the Tigers, hit .298 for Boston -- and then posted averages of .313, .320, and .315 the next three years. Webb petered out quickly. Though he hit .285 in 1932, with 28 doubles, he was so disappointing for Detroit in 1933 that he got only 11 at-bats before being sent to the White Sox. It was Webb's last year in major league ball. Alexander's first game in a Red Sox uniform came on June 15, 1932. He was 2-for-3 and drove in a run. On June 19, he had a 6-for-8 day in a doubleheader. By July 4, he was leading the team with a .367 average. Though he was a right-handed hitter, most of his hits were to the opposite field. "Ah'm a right-field hittuh, you know," he told the New York Times. He hit the ball hard, too. None other than Babe Ruth declared, "He sure bruises the ball." He maintained his average, hitting .356 at the end of July. One notable date was August 6 in Cleveland. Alexander's fourth-inning "treacherous hopper" bounced over second baseman Bill Cissell -- and proved to be the one hit off the Indians' Wes Ferrell in the game. On the 17th, he had a 3-for-3 day, and walked his other time up. Two singles and a home run gave him four RBIs in a 7-3 win over St. Louis. Eight days later, he went 3-for-4 and scored two runs. Alexander was batting .373 by Labor Day. His fielding drew positive comment as well. An exclusive in the September 11 Los Angeles Times, headed "Dale Alexander on Bat Spree," informed readers that "Stranger than this remarkable hitting is his first-base play, which surpasses even that of Harry Davis, the man who succeeded him, and who is recognized as one of the best in his line." September 21 was a 4-for-8 doubleheader, and on the 24th, he went 3-for-3, getting half the hits of the day off New York's Charley Devens. In the last game of the season, he had a 2-for-4 day. When the final and official figures were released, Alexander finished at .367 and won the batting title by three points over Philadelphia's Jimmie Foxx -- though one would have preferred Foxx's 58 homers to Alexander's eight, or his 169 RBIs to Alexander's 60. Had Foxx hit for a slightly better average, he would have won the Triple Crown. (He did so the very next year.) Alexander's totals were lower in large part because he didn't play as much. He batted 392 times to Foxx's 585. Under current rules, Alexander would not qualify for the batting title. Ted Williams had 386 at-bats in 1954, and walked a league-leading 136 times. Despite hitting .345, Williams lost the batting title to Bobby Avila, who hit .341, because he had fewer than 400 at-bats, the rule at the time. That rule has since been adjusted to count plate appearances rather than at-bats, so as not to penalize selective hitters who worked walks to get on base. In 1932 the requirement was to play in 100 games. Alexander easily exceeded that standard, appearing in 124 games. There's no way to compute Alexander's range as a fielder; one assumes it wasn't great. He did rank second in fielding average among American League first basemen. Ivan Weiss of the Seattle Times once called Alexander "a pure hitter, a DH before his time." Shirley Povich wrote in 1941, "Alexander never could play first base acceptably, but they couldn't bench his bat." What was Alexander's secret at the plate? "Ah don't look foh anything except a good ball. If it looks good, Ah swing at it" [New York Times]. He had excellent vision, and a good eye for baseball. Someone around Greeneville asked him if he had any trouble with the spitter. He replied, "No, I would just hit it on the dry side." Winning the batting crown paid off. His 1932 salary was $10,500. For 1933, he got a $500 raise, to an even $11,000. It also earned him a full column by John Kieran in the New York Times, and a new sobriquet: "The Nimrod of the Nollichucky." The reference was to a river near Greeneville and Alexander's love of hunting. In earlier days, baseball bats were heavier, thicker around the handle, and sturdier. Players rarely broke a bat. Was it perhaps an omen that just before the 1933 season began, Alexander broke his bat? Melville Webb mentioned it in the April 8, 1933 Boston Globe: "Dale Alexander is bemoaning the loss of his great war club -- the one with which he hammered his way to the top of the big league hitters last season. The bat was broken at the handle. Alex will have the bat painted and will hang it over his clubhouse locker." The broken bat was not the only reason he tailed off in 1933 and wound up with the only sub-.300 season of his career. Suffering a serious injury on Memorial Day, by season's end he had accumulated just 313 at-bats with a .281 average. He had five home runs and 40 RBIs. Sliding into home plate on Memorial Day, Alexander hurt his leg sliding into home plate. Red Sox trainer Doc Woods used a new deep-heat method to try to reduce pain, decrease inflammation, and thereby speed healing: diathermy. Unfortunately, Woods left the machine on too long (apparently leaving the treatment room and not returning for quite some time) and burned Alexander's leg. "They'd just barbecued his leg," said son Steve. Don Alexander reported, "It really sort of atrophied. It really was smaller than the other. Just like it was a burn. Scarring tissue. It was discolored." He was so badly burned that there was worry he might lose the leg. Fortunately, amputation was never necessary. Dale never blamed anyone for it, never complained about bad treatment, and certainly never sicced lawyers on the Red Sox. Perhaps in part that reflected a more stoic background, perhaps his Christianity -- he was an elder in the Shiloh Cumberland Presbyterian Church. Don said, "He played the game hard, and then when it was over, he came home. He never felt like anybody mistreated him in baseball." Another notable player -- another hot hitter -- suffered a problem due to diathermy treatment. In spring training of his 1936 rookie season, Joe DiMaggio's foot was badly burned in a diathermy machine. Within a couple of weeks, the foot healed and the Yankee Clipper went on to put together a pretty good career for himself. The effects of Alexander's injury weren't recognized at first. Shirley Povich of the Washington Post reported him as out of the lineup "as a result of a batting slump." Clearly, he was having an off-year. 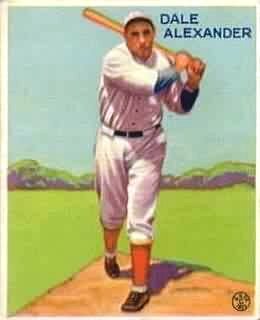 After 1933 Alexander never returned to major-league ball, but he played five full seasons of high-level minor-league ball and played it very successfully. First, he was involved in a series of transactions that made him seem like a hot potato being passed on. In December 1933, the Sox sent Alexander and three other players to AA Kansas City, with which they had a new working agreement. A February news release said the Sox released him to Jersey City for a couple of players. The Jersey City franchise was transferred to Syracuse, and then sold to the Newark Bears. For Newark, in 1934, he hit .336, for 264 total bases, and drove in 123 runs. He played in the American Association for Kansas City in 1935 and 1936, hitting .358 and .315, with 95 and 100 RBIs. On June 14, 1935, Moose hit four consecutive home runs -- then hit into a double play his fifth time up. Knocked unconscious by a beanball in August, he was hospitalized for four days and missed several games after that, but still put up some good totals. In 1937, he returned to Tennessee with Nashville, batted .319 and drove in 109 runs. He led the league in doubles, with 42. In 1938, he played for Chattanooga -- also in the Southern Association -- and hit .309, driving in 85 runs. When traded to Dallas, he refused to report and temporarily retired from the game. Beginning with the 1939 season, Alexander moved into managing as a player-manager his first four years, appearing in 98 games the first year for Sanford in the Florida State League. He hit .345 in 374 at-bats, and drove in 80 runs. In 1940, Alexander managed Thomasville, leading the Georgia-Florida League with a .388 average and with 14 homers. He drove in 96 runs. Another year, another team, another league: 1941 saw him managing Selma in the Southeastern League. He played much more sparingly, just 64 at-bats, but batted .438. In 1942, Alexander returned home, playing and managing for Greeneville once more. He didn't play much, though, with just 19 at-bats in 19 games. His average fell to .158, and the time had apparently come to pack it in as a player. A baseball field in Greeneville is named after Dale Alexander. During World War II, most minor leagues suspended operations and Alexander returned to working his farm. He continued to manage after the war until early 1948, when he resigned as manager of the Knoxville Smokies to take a position as a scout for the New York Giants. He is credited with signing Ernie Bowman, Jim Constable, Gail Harris, and Joe Shipley, and with being the first to spot Willie McCovey. Alexander combined scouting with an occasional slot as manager -- for instance, his late June appointment to skipper the Jacksonville Tars. In November 1962, Alexander took a job scouting for the Milwaukee Braves. In terms of recognition, Dale Alexander remained a forgotten bat king. The Red Sox could hardly have been a lower-profile team, perennial tail-enders for a decade. He never received a plaque or trophy of any kind. "Not a thing," said son Don, but that was OK with Dale. "He was a private person. He never bragged about anything. You could have ridden from here to California with my dad and never know he'd played baseball." Don said that half of what he learned about his dad came from scouts or other folks who filled him in. Steve Alexander agreed. "I remember people talking when he was scouting in some of these coal mining towns, saying, 'Well, Dale, you sure must have been proud. ...'" Dale's reply? "'No, what I did was no more than the lady winning first prize for cornbread at the county fair.' To him, he just did his job." Steve said his father "never had a Christmas card, nor was he ever invited to any Red Sox functions as a former batting champion." Both of Alexander's sons played baseball. Don spent a year in industrial ball with the Monsanto Chemical Company team before he became a minister. Steve pitched and played semipro ball, and coached baseball for years at Tusculum College. Even into the 21st century, he remained active in senior baseball; his team won the Senior World Series in 2002. During the 1970s, Don Alexander said, his father scouted for both the Braves and, to some extent, for the Red Sox, passing tips to scout George Digby. Digby was the only person on the Sox that Dale had contact with. He never held any grudges, however, and followed the fortunes of the Red Sox, rooting for them in the 1975 World Series. In 1970 Dale Alexander was diagnosed with prostate cancer. He battled it for nine years before his death on March 2, 1979. In addition to the sources cited within the text, I interviewed sons Rev. Don Alexander on October 12, 2003, and Steve Alexander on October 22, 2003.